Yes, they’re free to install. But there’s more to the story. Most shoppers know nothing is ever truly “free.” If someone is offering you a “free” vacation in Florida, you better believe that it’s going to come with a sales pitch to buy a timeshare. Websites that offer to ship you free goodies usually just want your address so they can send you junk mail. Heck, even those “free samples” at the grocery store mean that you have to listen to someone talk about how great their product is. So, if you’ve ever heard a solar panel salesperson talk about how awesome “free” solar panels are, then you probably feel pretty skeptical. And you should be. Though it’s possible to install solar panels with no upfront costs, it’s misleading to call them “free solar panels.”. A PPA is an agreement between a solar installer and a homeowner that allows them to install rooftop solar panels for little or no cost. 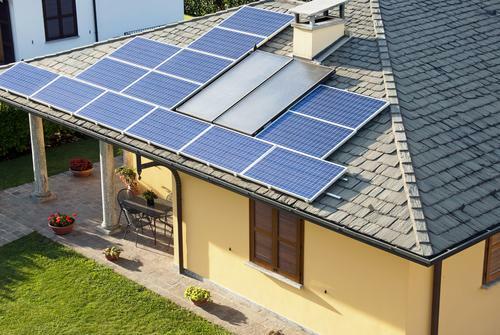 Homeowners don’t own the solar panel system, and they don’t even lease it. Instead, the installer sells energy generated from the solar panels at a set per-kWh price. Installers are also entitled to any tax credits that are associated with installing a solar system. Related: How affordable are solar panels? The contract for PPAs usually lasts between 10 and 25 years. At the end of the contract term, homeowners have the option to renew the PPA. They might also have the option to simply purchase the system. There are a few reasons why a property owner might find a solar power purchase agreement attractive. No Upfront Cost: All of the expenses involved in buying and installing a solar panel system are handled by the installer. This allows the customer to start saving money on energy on day one, without any initial investment. Lower Energy Bills: The price of energy in the contract should be less than the price of electricity from the grid. Even though the homeowner doesn’t own the solar panels, they can still pay less for energy. Possible Increase In Property Value: Depending on your contract, the PPA can be transferred to a new property owner. That means that a home might be more attractive to a home shopper who also is interested in a smaller energy bill. Hassle-Free, Green Living: Some also agree to a solar power purchase agreement for environmental reasons. It allows property owners to lower their carbon footprint quickly and affordably. Why Do Companies Offer Free Solar Panels? Solar power purchase agreements are more common in some states than others, depending the incentives that are available. Tax Credits: The US government offers a 30% tax credit to anyone who installs solar panels. Since the installer owns the panels after they install them, they can claim those credits. Net Metering: Depending on laws in your state, it might be possible to feed excess energy generated from a solar panel back to the grid. The company that installs your panels then might be able to profit from this extra energy. Solar Renewable Energy Certificate (SCRECS): Some states with clean energy programs require power companies to produce a certain amount of energy using renewable sources. However, the power companies don’t actually have to generate this power themselves. Instead, they can purchase Solar Renewable Energy Certificates from individuals in order to fulfill their legal requirements. Is A Solar Purchase Agreement Right For You? There are a two things to consider before you agree to a PPA. The goal with a PPA is to buy energy from a price that’s lower than energy offer by your local utility. Your bid should contain details about the system that will be installed, including its brand and performance. Most companies provide you with a side by side comparison of your energy costs with and without the solar system. It’s difficult to project energy costs far into the future, so be sure to check where they got their numbers. Don’t fall for a bait and switch. Ensure that the terms of the contract match what you were promised by the salesperson and any advertisements you saw. Check any fees you’re responsible for, who will cover repairs, how long the contract lasts, and if you have the ability to renew. While a solar power purchase agreement doesn’t have all of the same benefits as leasing or buying solar panels, they do have the potential to decrease your energy bill and lower your carbon footprint by putting little or no money up front. Ready to learn more about solar power? Click here for our in-depth comparison of SolarCity and SunPower. "What they’re really talking about is solar power purchase agreements (PPAs). "